The Pride Parade marks the unofficial start of the pride celebrations, the moment where excitement and celebration commence (and, of course, the drink). We have compiled a few convenient spots to stop off for a boogie, bev or glitter throughout the parade route. 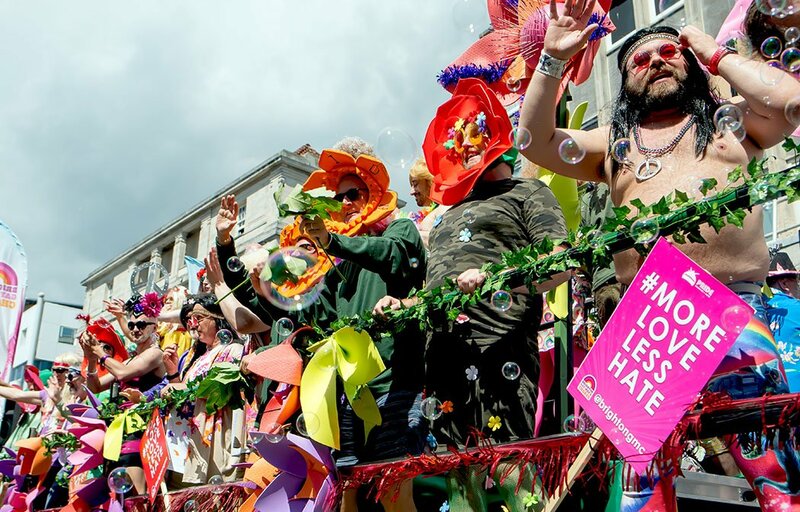 Read on for the best spots to celebrate the parade and where to watch Brighton Pride 2018. Located just at the top of West Street, it’s the perfect first stop off to catch a bit of shade and rehydrate for the day, even if that is with a beer. They’ve also decided to go all out with the Britney theme, because well it’s Britney! There’ll be a load of 90’s bangers to warm you up for an incredible day/weekend, bringing back a load of sweet nostalgia on their very own summer terrace. Oh, and you might just see a cardboard cut-out or two of Queen Brit. Immerse your senses in a tropical delight with Be at One’s limited edition pride themed cocktails, all decorated to perfection, the only way they know how. There will be a pop-up bar, slushies and live DJ’s throughout the day and night. The best bit? In conjunction with Bloody Beautiful, Be at One are offering to do glitter for your face, beard and any other part you may want to sparkle up (within reason) for a small fee between 12 and 3pm so you can look absolutely fabulous this Saturday. Don’t miss out on this short time opportunity. This wonderful queer little pub had to make the cut for the places you should stop off at throughout the pride parade, or even before as they will be providing some tasty vegan street food. Line your stomachs the right way with a range of brekky foods like your hard-to-beat take on a full English, a breakfast burrito or maybe some French toast with fruit, syrup and yoghurt, yum! Apart from a cosy yet vibrant place to have a quick break, the Gay Games are open to all, bringing all from each walk of life together for an event of solidarity. North Laine Brewhouse is a special pub, a place for everyone no matter who you are, what drink you like, what gender you may identify with and is a spacious and atmospheric setting for all. We’re not too sure what they’ve got in store, but if they’re regular drag Thursdays are anything to go by, we know it’s going to be good. Not forgetting they’re renowned for their excellent selection of delicious craft beer that will quench your thirst a treat. This pub is quite unique in many ways, might it be the huge Kraken octopus painted on the outside, the unusual drinks, never ending space or all the fun games they have on offer. They’re not talking a bit of Monopoly or Scrabble, it’s an actual arcade with car racing, air hockey, retro gaming machines and only a virtual reality space. All this combined with the 10 am- 2am free DJ set will make your venture here an absolute laugh and an overall great time. Last but not least, the final destination before the big proceedings at Preston Park, the Joker have – and always do – gone all out for Pride weekend. Your feel-good tunes will be blasting through the day and you can watch the parade pass by with their outside bar. They’re also teaming up with Poparazzi Pops to give you some champagne ice pops as the day goes by, keeping you refreshed and classy. Don’t worry we haven’t forgot that their iconic glitter cannon will be making an appearance, filling the skies with sparkle and shine. At this lovely venue, they Choose Love. Viewing by the British Airways i360, Old Steine (try to be elevated if you can!) and at the bottom end of London Road are all decent viewing spots.